MUSLIMS ASK, CHRISTIANS ANSWER Christian W. Troll, S.J. Answering questions Muslims ask Christians most frequently. The book's chapters are: Scripture and the Word of God; The Divinity of Jesus and the Incarnation; Cross, Sin and Redemption; Muhammad and the Christian Faith; God, the Three in One; The Church; The Holy Eucharist; Prayer; Religion and the World; Celibacy as a Religious Vocation; Religious Pluralism and Freedom of Religion; The Heart of Christianity. Interreligious dialogue involves the sensitive asking of questions in order to achieve mutual understanding and respect. In this introductory text Father Troll shows himself to be a faithful Catholic practitioner of dialogue and an outstanding scholar of Islam. Based on his decades-long experience living and teaching among Muslims, Fr. Troll answers questions asked by Muslims about the beliefs and practices of their Christian neighbors. He places each set of questions within the context of contemporary Muslim perceptions, along with their sources in Islamic scripture and traditions. Fr. Troll answers them following orthodox Roman Catholic and traditional Protestant teachings. 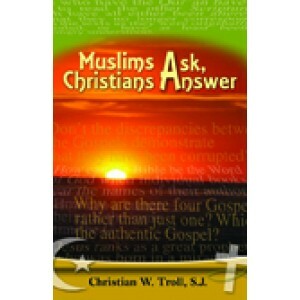 Muslims Ask, Christians Answer is a must-read for both experts and casual readers alike. For any serious-minded Christian who wishes to live harmoniously with our Muslim neighbours, it could be said to provide essential reading. This reading may require a degree of concentration, but the precise and methodical way in which the subject-matter is presented greatly facilitates this. Each chapter starts with a set of questions that Muslims often ask of Christians. We are then invited to consider the religious and cultural background that provokes such enquiries. We are then presented with the Christian answers. In addition to satisfying the interest and curiosity of others, the book does much to explain to Christians themselves many puzzling aspects of their own religion. This book provides essential reading for people of all faiths or none who wish to live together harmoniously in the multi-cultural environment which prevails in this country today. Although this book is intended primarily for Christians, to enlighten them with regard to their own religion and to provide them with the information necessary to engage in dialogue with Muslims, it would also be a valuable book for Muslims to read in order to understand the differences between the two faiths. Each question is dealt with ably and diplomatically in clear prose understandable to the layperson, and the questions covered are certainly those that are mostly like to arise in conversations between members of the two groups. I would highly recommend this book for any library. Christian Troll has done it again. This little work exhibits his theological sophistication as a mature student of Islam in simple, superbly organised prose … Troll illuminates Muslim and Christian sources and traditions with exquisite fairness … He canvasses five key doctrinal issues … Christians seeking to learn more about Islam will take surprisingly fresh measure of their own tradition, and vice versa … Troll’s clarifications … can certainly help to undermine settled distortions, but nothing can substitute for actual dialogue between believing Christians and Muslims, which this fine study calls for. We will be better able to fulfil that responsibility – in the office or our neighbourhood – after learning from these pressing issues so superbly canvassed here. This book encourages dialogue between the two traditions and critical self-reflection on the part of each, especially Christians … It is a serious effort to encourage Christians to listen carefully to the questions Muslims pose and to respond thoughtfully. It consists of 12 chapters, each of which is devoted to a specific set of questions … The volume contains a useful bibliography and set of notes. Summing up: Recommended. Academic and Public libraries; lower- and upper-level undergraduates, graduate students, and general readers. About the author Christian W. Troll, S.J.